NO-The LA is not the smaller and the LB the larger. The LA is the earlier model and was made in two sizes. 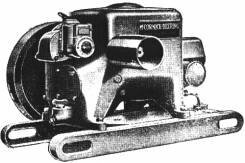 The LB is the later model and was also made in two sizes, 1-1/2 to 2-1/2HP and 3 to 5HP. The easiest way to tell the difference if there is no tag is by looking at the valve rockers. The valve rocker arms on the LA models were oiled by an oil cup on the end of the valve rocker shaft. The LB models were self oiling and there is a tube coming out of the front of the block going into an oil trough filled with felt above the rockers. Just about everything interchanges between both models if they are the same HP. Again there are exceptions but we can help you get it right. It's a good idea for LA owners to order both manuals as the LB manual has very good parts illustrations which again are basically the same parts. The LA's were made from 1934 to mid 1941 and the LB's from 1941-48. Like the 'M's they were all throttle governed. A note on decal placement. The Globe decal goes on the flywheel side of the engine, the McCormick Deering decal goes on the pulley side. HMR14 Piston Ring, 3 1/8" X 1/8" 1-1/2 to 2-1/2HP 6.60ea. HMR16 Piston Ring, 3 1/8" X 1/4" Oil, 1-1/2 to 2-1/2HP 7.70ea. **Note: We now have 'LA' rocker arm brackets available.